Look for the hidden bunny! Complete with colorful hanging ribbons, a tiny framed piece of art, and a red and white mushroom table. When the wind blows, these colorful ribbons will flutter in the breeze. A pretty blue roof keeps out the morning dew for your little fairy friends. Large green leaves make a woodsy roof for this small home. Ready for moving day! This tiny twig house is the perfect size for your wee garden folk. A fairy house with a roomy back deck! Features a handmade ladder adorned with dried Hydrangea blossoms. A river rock provides a place for your guests to sit. Comes complete with a leaf carpet! This handcrafted fairy house is made of REAL twigs, bark, rocks, dried flowers, pine cones and fir needles - all gathered from the Pacific Northwest. All of my houses are for indoor use only. They are sturdily built for real play. Suitable for toddlers to adults. Tiny houses just right for fairies! Pretty pink and blue flowers grow gracefully around this petite house. A tiny loft is inside so your fairies can rest after a hard day of visiting the flowers. A magical little house for your fairies! What a cheerful little abode for fairies to play in! If your fairies are looking for a quiet place, let them come inside this small house and close the tiny twig door. They can listen to the tiny yellow bird sing for them while they nap on a sunny afternoon. A tiny dwelling for your tiny guests! A spacious fairy house for a fairy family! Tiny leaves cover the roof to keep out the morning dew. Real moss and real rocks add to the fantasy. A sunny house for your fairies to play! Let the lovely garden breezes into this tiny house. Your fairies can enjoy cool shade in this open air home. Twig lattice work woven with tiny vines. A yellow bird sits outside the front entrance. Your garden fairies will enjoy playing in this cute little house! Small unique fairy doll houses with lots of places to explore! A pretty pink tree grows in the front yard alongside a tiny mirror. Your fairy can listen to the sounds of the miniature bird sitting in the back yard birdhouse. Look who is lurking in the bushes? Flamingos! This tiny abode is round with a high, arched roof. Our fairy houses are a perfect size for our tiny fairy dolls! This house features a tiny pink plum tree growing right outside. Your fairies can gaze at their reflection in the tiny mirror. A built-in twig swing provides an afternoon of fairy fun! Handcrafted and definately one of a kind! Woven twigs found in nature welcome little fairies to their new abode. 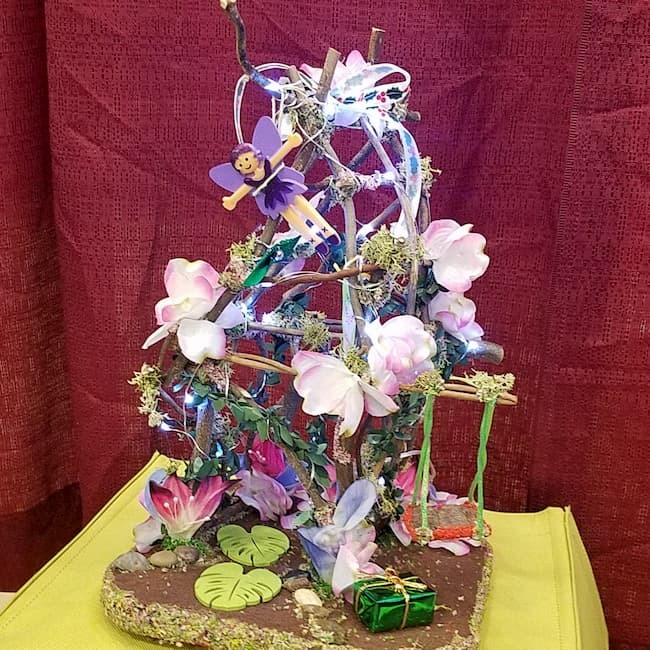 Open the tiny twig door of this fairy house to see a miniature hanging leaf swing. A small blue bird nest with a bird hangs outside the front entrance. White daisies grow over and around this abode. This little house welcomes you! Walk through the arched entrance to a perfect hideaway.